Click on subject links below for the answers to your questions. How can I join my team members when I’m outside the LAN? With eDocSync you can always join your workspace members even if you are outside your LAN as long as your company gives permission to communicate with contacts outside the LAN. If your company does not allow you to communicate with the outside you will need to connect to the public Meeting Point provided for free by SyncEvolution. If your company has a private Meeting Point you can always communicate with your contacts. What happens if I need to work on a document that is already in use by another member? No problem. You can always open and process your document the usual way. You will never interfere with the work of any other member. Neither the changes of your workspace members nor your own changes will get lost. How many simultaneous versions can I have for one document? You can have as many simultaneous versions for one document as you have members in your workspace. Can I work on my shared documents if I’m not connected to the Internet? Yes, you can always process your documents, whether online or not. Your documents are always stored on your computer and as soon as you are connected again, your changes will be shared with the other team members. What happens if I need to work with somebody who doesn’t use eDocSync? Documents from outside eDocSync can always be integrated into the existing document history of eDocSync by simply dragging and dropping the external document to the desired document. They can then be merged with existing documents or declared as latest versions any time. What if I want to synchronize my modifications later in time? Upon saving and closing your document a confirmation window opens asking you whether you would like to synchronize your documents immediately, later or cancel all modifications made. Simply choose the “Synchronize later” button and your work will be saved but not synchronized with the other members of your workspace. You can synchronize on demand by simply clicking on the document and choosing the synchronize menu. How many workspaces can I create with eDocSync? As many as you like. eDocSync does not limit your possibilities to share with others. How many documents can I share with eDocSync? Unlimited. To share knowledge and information is your business capital. eDocSync is there to support you in teaming up and working efficiently with others. How can I communicate directly with my contacts? There are two ways to communicate. You can simply send a short message to one or several contacts at a time or you can start a chat with as many contacts as you like. How can I find out about the current status of my document? For each version of a document the symbols in front will indicate the status of the document. On top of that even more information is contained in the tool tips associated to each document. Simply run your cursor over the document name to read the associated information. How can I synchronize my eDocSync if I am alone? Even this is possible! All you have to do is install eDocSync on one computer that you let run all the time (like a mini-server). This way everybody has always access to the latest information and updates. What is a simultaneous version? With eDocSync each member can edit and modify the same version of a text document at the same time. Everybody works on his own document; you don’t see in real-time what the others are typing. This can result in several paralleling versions of the same text document which we call simultaneous versions. The meeting point relays information between eDocSync users when they are not directly accessible via Internet. Why do I need to register on the contacts directory? The contacts directory allows eDocSync’s users to see all the other registered eDocSync’s users. Users who haven’t joined the contacts directory will only see all contacts of their contacts. With eDocSync your documents are always safe. 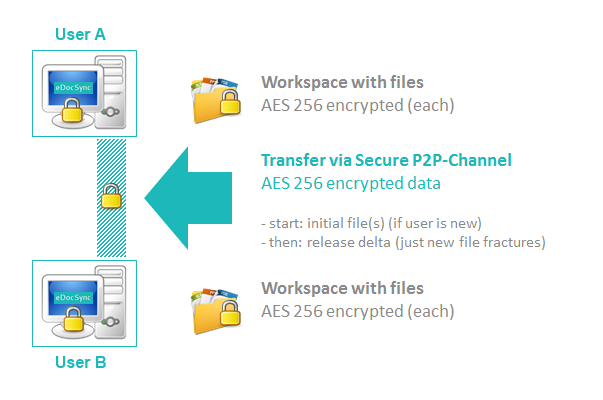 During the synchronization process, all transfers containing the documents and personal data are encrypted (AES 256 bits) and all communications between members use public or private key (RSA 1024 bits). On top of that, only the changes made to the documents are transferred during the synchronization process, not the entire document. The entire document is only transferred once to everybody during the initial upload. Why should I save my profile data? It is important and recommended to save your profile on an external device so you still can recover all your shared documents using your eDocSync profile in case of hardware failure. Can I save the complete content of a workspace? Yes, you can archive the complete content of your workspace as a .zip file anywhere you like, as long you have the right to do so, of course. How can I control the access of the members to my documents and folders? If you are the regulator of the workspace, you can assign the rights to read, modify or delete to each workspace, folder, sub-folder and document individually. Are my documents stored on an external server? No document is ever stored on an external server managed by SyncEvolution. Are there any limitations as to the size of a document I want to process with eDocSync? There are no limitations to the document size. Since only the deltas of the changes made to each document are transferred during the synchronization process, the size of the document is irrelevant and will not have any effect on your working process. Which types of documents can I share using eDocSync? Any type of documents can be shared with eDocSync. What happens with my eDocSync if I need to change my computer or if I need to switch the location of the eDocSync working directory? Very easy! If you want to switch the location of your eDocSync working directory or change your computer, simply copy the complete directory, select a new location and paste it, restart your eDocSync and insert the new path. Which documents can be merged within eDocSync? The merging process works for text files, Word and Openoffice documents. Today, eDocSync exploits and optimizes the merging tool from Microsoft Word and Openoffice. Can I manage my network settings? With eDocSync you can manage your port, your download and upload speed, and much more. Simply go to the advanced configuration section to check out the possibilities. 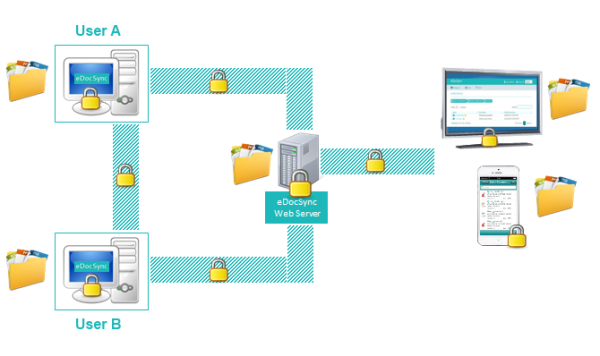 What happens if the network breaks down during the synchronization process? Don’t worry, be happy! eDocSync will manage the synchronization process for you. As soon as you will have a new connection, the synchronization process will be automatically continued by eDocSync where it has been cut off. Where can I find your Release History? You can view our Release History here.